Once again a paper that looks at solar-climate connection turns out to be deeply flawed. It contains bad methodology, bad result handling, bad conclusions, and a biased reference list. Data handling process of Lüdecke & Weiss (2018). A few months ago, a new paper was published by Lüdecke and Weiss (LW17). Both Lüdecke and Weiss are known climate change contrarians. Serious problems have been reported from their previous work, which used some of the same methods that were used in this new one. The new paper has been published by Bentham Open, which has somewhat questionable reputation. Climate change contrarians are liking this of course and recently I also encountered the paper when it was shown to me as a proof for something. I decided to take a more thorough look at the paper. The first thing that jumps out from LW17 is the papers they cite in their introduction section. You can immediately see that their review of existing research is biased. They cite Scafetta but not his critics. They cite Svensmark but not his critics. They cite Friis-Christensen & Lassen but not their critics (even F-C & L themselves have later agreed that the findings they reported in the paper cited by LW17 were not correct). They cite lots of papers that suggest some kind of influence of the sun on Earth’s climate, but they leave the multitude of papers that state clearly that sun hasn’t caused current climate change almost un-cited. The reference list of LW17 is quite long which suggests that they have been relatively thorough in trying to find lot of references that support their argumentation. It also hints to the possibility that the biased reference list is by design and not just an accident due to sloppy paper search. The methods section (sections “The Data” and “Spectral Analysis”) of LW17 contains some curious issues. Perhaps the worst aspect of the methods section is that they haven’t described all the methods they used. Their later sections contain many steps that haven’t been described with enough detail in the paper, such as making a representation of the temperature reconstruction from the three sine waves and the steps involved in solar variability – temperature comparison. For Bün, HADCRUT4 and Pet respectively the most recent years which show unusual deviations from the remaining reconstructions were also omitted. This is a kind of thing I have seen climate change contrarians using in their fraud accusations. Yet, I have seen climate change contrarians claiming to have read this paper thoroughly and accepting it as truth without a question, and even defending it fiercely. Another thing is how LW17 have adjusted the satellite data to HadCRUT4 data. They took 1979 values for each and then shifted satellite data so that their 1979 values were the same (I’m not 100% sure that they did it exactly like this – they don’t give the details – but I think that the process I described results in what they did). I think using only one year worth of data to align the two records is a bad idea. It’s especially bad because there was an El Niño in 1979-1980. El Niño generally shows up more in satellite records than in surface temperature records so using an El Niño year as a baseline creates a bias between the two records (the satellite record runs a bit low after this). I would have used several years of data to align the two records, 10 years for example. They also seem to use only one year data to align their source reconstructions together. LW17 have used temperature reconstructions from all over the world. This is good. They have also adjusted each reconstruction to a common baseline. This is also good. Their method to create a global data set out of them is a bad one, though. They have computed a simple mean of the reconstructions for each year. There is no area averaging or anything but just a simple mean. To illustrate why this is bad, they have only three reconstructions from the Southern Hemisphere (SH) while they have dozens of reconstructions from the Northern Hemisphere (NH) (making their reconstruction practically a NH one instead a global one). This means that the three reconstructions from SH are strongly out-weighted by the NH reconstructions. In a global temperature reconstruction both hemispheres should have an equal weight but in LW17 they don’t have that, not even close. 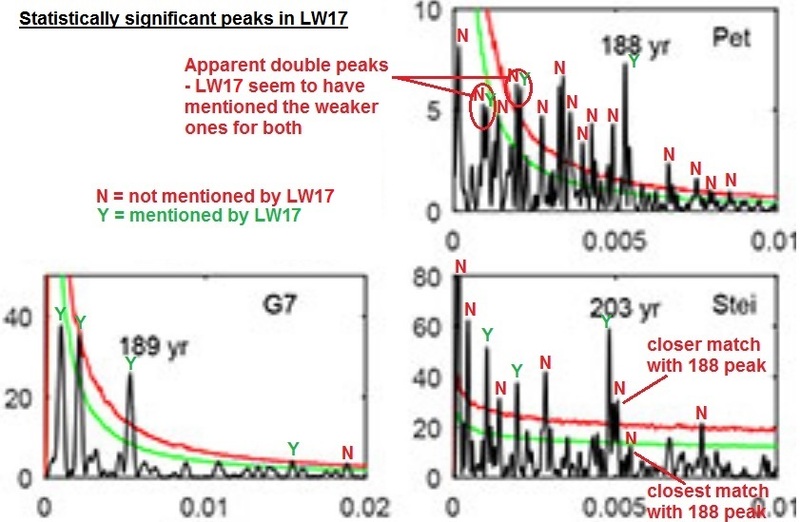 Making the SH-NH imbalance even worse in LW17, two of the three reconstructions from SH only cover time-period from 1640 to 1987 and from 1640 to 1993 while they describe their reconstruction as “a global temperature mean G7 over the last 2000 years”. Furthermore, the only SH reconstruction covering the full 2000 years is an ice core based temperature reconstruction from Antarctica which has temporal resolution of 17 to 50 years while the NH records have annual resolution. Hence, most of the LW17 temperature reconstruction is lots of NH records + one bad resolution SH record. In addition, all the proxies are from land areas but LW17 use global instrumental and satellite data which includes also ocean surface area. Yet another thing is that the NH reconstructions in LW17 seem to be somewhat clustered around North Atlantic, which is a region known to show the Medieval Warm Period very clearly. Overall, the LW17 temperature reconstruction is a strange mix of reconstructions patched together with very questionable methods, and it really is just a NH reconstruction with an emphasis on North Atlantic region. 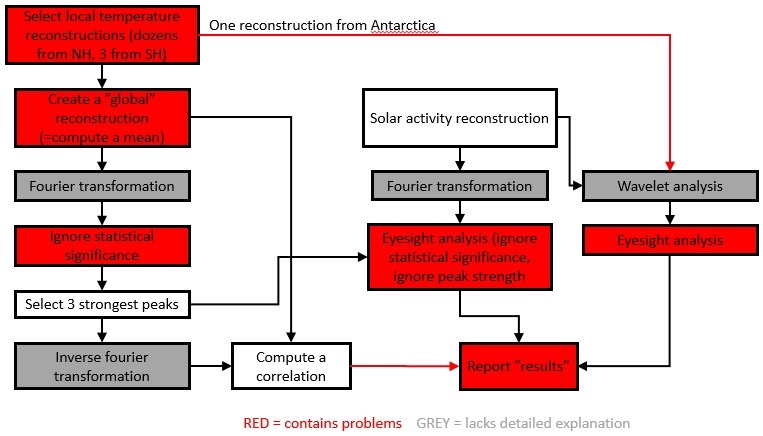 For the solar activity, LW17 use only one reconstruction that has been constructed from different sources. They seem to use the reconstruction as it is without tampering with it, which seems to be a good thing in the light of what was seen above. In their analysis, LW17 concentrate on cycles only and mainly to past climate, so the study has only little relevance to current climate change. Causes of past climate changes do not mean that greenhouse gases couldn’t cause climate change now, and the presence of cycles in Earth’s climate don’t negate the effects of greenhouse gases, but climatic cycles and greenhouse gas forcing can (and do) co-exist. LW17 don’t offer much new to sun-climate connection knowledge either because their main result is a possible correlation between the two which doesn’t offer any information other than solar variability might have an effect on Earth’s climate, which we knew already anyway. But in addition to general insignificance of the study and the problems identified in the previous sections, there are further problems in the results section of the paper. LW17 perform a Fourier transformation to their temperature reconstruction and then they select three strongest peaks from the Fourier transformation result. However, from their Figure 2 can be seen that one of the selected peaks (the 1000-year peak) is not statistically significant (it doesn’t exceed what they call “false alarm line”) while some of the statistically significant peaks (~65 year and ~50 year peaks) were not selected. LW17 do not discuss the issue. They just state that they have selected the three strongest peaks. Next, LW17 use the three selected peaks to do an inverse Fourier transform. The result of this is a representation of their original temperature reconstruction. This hasn’t been described in the methods section, and they don’t also describe it in the results section adequately. They only mention that they have done an inverse Fourier transformation. They compute a correlation between the original temperature reconstruction and the sine wave representation. Resulting correlation is quite good, but it doesn’t mean much because they correlate an original series with a series that has been constructed from the original series. In practice, they just compute a correlation between two representations of a same signal. This would be okay if they would have just used the correlation to check that the temperature reconstruction from the three sine waves is a reasonably good representation of the original reconstruction, and then proceed with the actual analysis, but they seem to treat the correlation value as one of their most important results, and there’s no further analysis with the inverse Fourier representation. LW17 continue their analysis under the section “Sun’s Activity and Climate”. For many readers, it probably will not be a surprise that this section also contains problems. In this section, LW17 first discuss the Fourier transformation results of solar activity proxy series they are using. Their discussion is a stub one. Based on the peaks found, they mention that the three peaks selected from the temperature reconstruction can also be seen in solar activity series. Below is an excerpt of their Figure 2. The Table 2 (T2) of LW17 claims to show “Strongest spectral peaks for the records Chr, Bün, McK, Vill-N, Vill-S, Pet, G7, and Stei for periods > 700 years, from 700 to 300 years, from 300 to 100 years, and < 100 years”. From the figure above it can be seen that this is not the case. Highest peak of series “Pet” (ice core record from Antarctica) is very close to 0 (corresponding roughly to a wavelength of several thousand years) and the mentioned peak in T2 seems to be a double peak of which the weaker one seems to be better match in wavelength with the peak mentioned in T2. The mentioned peak of 499 years in T2 also seems to be a double peak and here better match seems also to be the weaker one. For both of the double peaks, it is of course difficult to estimate the situation from the graph, but it does seem that LW17 have selected the weaker ones of the mentioned double peaks to T2. The series “Stei” (the solar activity proxy series) also shows stronger peaks than the ones mentioned in T2. Above 700 years there are two peaks clearly stronger than the mentioned 991-year peak. Also from 700 to 300 years there is one higher peak than the mentioned one. The figure above shows also that it is easy to find matches for peaks when there are plenty of peaks to choose from. Highlighted is the selection of the peak in “Stei” that corresponds to the 188-year peak in “G7” (and in “Pet”). There are weaker peaks that are closer matches to the wavelength of 188-year peak than the highlighted 203-year peak. One of these is also clearly statistically significant at about 197 years. Moving on past the selection of solar activity peaks, it should be noted that after LW17 have selected the peaks, they don’t do much about them. They don’t construct a representation of temperature and calculate correlations or anything like they did for temperature series but instead they just mention that the solar activity “shows the same periods” as temperature reconstruction based on the values presented in T2. One further thing about the figure above, the solar activity series “Stei” shows lot of peaks and as discussed above, some of them are more meaningful than the ones LW17 emphasize. Why those peaks do not show up in the temperature reconstruction? This point has not been discussed by LW17. Next step is a very curious one. They proceed to check the solar-climate connection further, but for some reason they drop their temperature reconstruction G7 and start using “Pet” which is the low-resolution ice core proxy from Antarctica. They don’t justify this at all. The method they use here is not described in detail. They only mention that they do a “wavelet analysis”. At the end, however, their analysis here doesn’t extend beyond studying “eyesight similarities”. In their introduction section, LW17 created a false picture of the situation of current research status of the solar activity – climate connection by citing mostly papers that support LW17 argumentation and ignoring most of the papers that show results against their argumentation. They did a not-even-half-baked analysis containing lot of flaws. In their conclusion section LW17 then suggested that their flawed results are a “confirmation” for the false picture created in the introduction section. We can also wonder what was the point of the Fourier-inverse Fourier exercise LW17 did (with subsequent eyesight “analysis”), because if you want to demonstrate a solar-temperature correlation, then why not just compute a correlation between them directly? It is curious that they didn’t do this at least as a side-note, surely it would (or should?) have been interesting also to them. In my opinion, LW17 is throughout bad science – biased citing, bad research methods, strange interpretation of results, etc. Having seen and studied the paper, I cannot help wondering what this quote from LW17 acknowledgements section means: “We express our thanks to the referees for valuable comments.” If the referees gave valuable comments and the resulting paper still is as bad as described above, how bad was this paper originally?